After a rash of severe storms, resiliency has gained the attention of homeowners, construction professionals and the insurance industry. That’s why insurance companies, state insurance regulators and government agencies are providing significant insurance discounts for homes built to new, more resilient standards like the FORTIFIED Home standard created by the Insurance Institute for Business & Home Safety (IBHS), or the recently announced Department of Homeland Security's Resilience STAR standards. 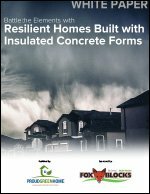 This white paper covers one popular approach to building a storm-resilient home — using insulated concrete forms (ICFs) for the wall assembly and foundation.